March 20 is the official start of spring, but most Delaware residents note the beginnings of this season as the landscape begins to erupt in vibrant, colorful blossoms. Wilmington and Brandywine Valley are among the best places on the Eastern Seaboard to enjoy the delightful sights and scents of historic mansions, which are literally brimming with rainbow-hued azaleas and tulips, roses and orchids. 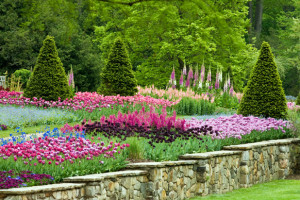 Celebrate Mother Nature in all her glory with a day trip to Delaware’s famed botanical gardens and museums, where you can reboot both mind and spirit with a relaxing tour amid towering trees, elegant estates and enchanting horticulture displays. Rated the country’s number one public botanical garden by USA Today, Longwood Gardens promises breathtaking beauty at every turn. Located in Kennett Square, Pennsylvania, this family-friendly hotspot boasts indoor and outdoor gardens which lure more than a million visitors each year. Longwood began in the 1800s as a Quaker family’s arboretum. Later purchased by the du Pont family, Longwood now contains 10,000 species of exotic plants, which cover more than 1,077 acres of rolling meadows, heated greenhouses and outdoor displays. Right now, visitors can revel in the colorful blooms of freesia, highbush blueberry, orchids and tower-of-jewels. Learn more about horticulture and the history of Longwood on a guided tour that suits your unique interests. 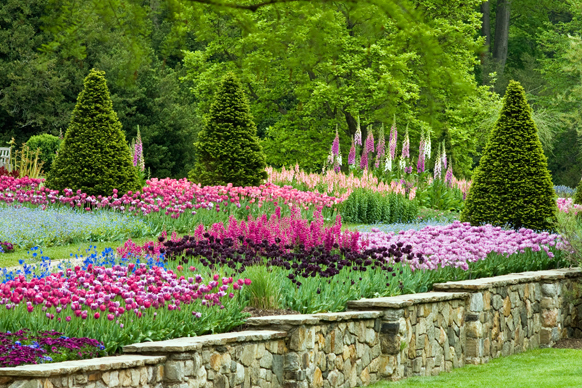 Spring at Winterthur is nothing short of spectacular. Spanning 60 acres, this naturalistic garden and estate was founded by Henry Francis du Pont whose keen collector’s eye ensured a continual stream of blooms from January through November. Tour du Pont’s luxurious estate, which is surrounded by lavish flowers and gardening displays. On April 16, Winterthur will host Daffodil Day on Sycamore Hill, which includes kids’ arts and crafts, special tours and a children’s daffodil show. On May 7, visitors can enjoy thousands of azalea blossoms and acres of wildflowers, and Winterthur’s peonies and primroses should be in full bloom by May 15, when guests can partake in guided tours, a lecture from the director of the Morris Arboretum, and browse plants for sale. One of Delaware’s most overlooked gems, the Read House & Gardens is a treasure trove for anyone who appreciates springtime blossoms and a little revolutionary history. The estate is situated in the New Castle historical district, bordered by one-and-a-half acres of formal gardens. This Federal style mansion, built in 1801, boasts three separate gardens that are overflowing with dazzling azaleas, tulips and manicured trellises during the spring. The estate is also a short walk from New Castle’s best shopping and dining, making this an ideal starting point for a weekend getaway. Given its range of historic, recreational and cultural points of interest, Delaware continues to attract families, singles and retirees who are looking for a better way of life. The planned community of Darley Green, located in Claymont Renaissance District, offers convenient access to downtown Wilmington, and is less than half an hour from Pennsylvania. To schedule a tour of our luxurious yet affordable townhomes in Delaware, we invite you to contact Montchanin Builders at 302.655.2600. Our move-in ready homes are priced to sell and feature amazing incentives for first-time buyers!